Reputable BBC ‘s review on the story of two rugs, one given to US President Calvin Coolidge, and another recently found in a home in San Diego, helps unravel the history of the US’s first humanitarian aid effort and the tragic fate of Armenians in Turkey 100 years ago. When Maggie Mangassarian-Goschin walked into the home of 97-year-old Elibet Kunzler last July, she instantly knew the importance of what she had found. Lying in the middle of the living room was a striking, colourful rug with more than 800,000 hand-tied knots. It was decorated with exotic plants, prancing deer and leopards that almost looked like they were leaping off the ground. To Mangassarian-Goschin it was clear this was an incredible missing piece of history. 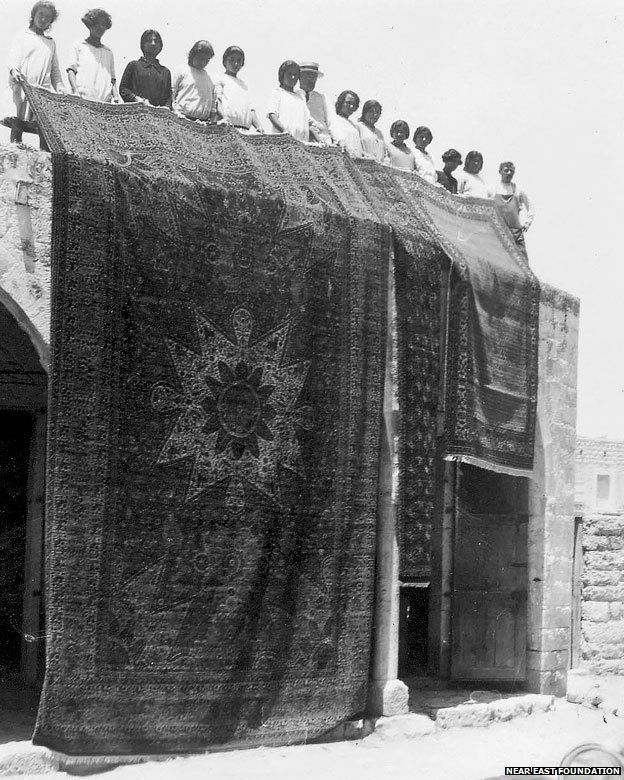 The rug was woven by refugee orphans in Lebanon who had been saved from the 1915 Ottoman-era massacre of 1.5 million Armenians – a massacre that many scholars regard as genocide. More than 3,000 rugs were made and given to American donors who had paid for the children to be looked after. This one remained hidden for almost 70 years in Kunzler’s home, travelling with her from Lebanon, to New York, New Hampshire and finally San Diego, where she settled with her husband and children. 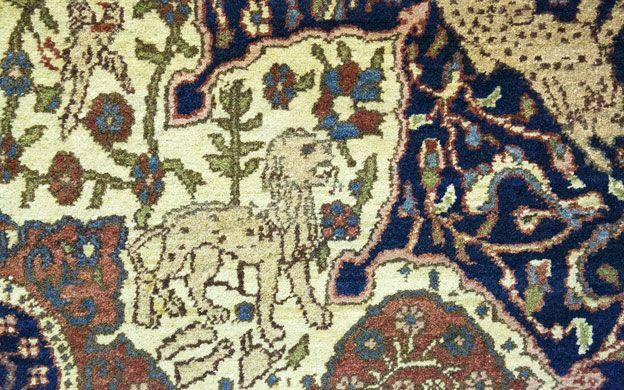 “I had a feeling, that there was something with this rug, because I had never seen anything like this in my entire life,” says Mangassarian-Goschin, director of the Ararat-Eskijian Museum in Mission Hills, California, which specialises in Armenian antiquities. Now, on the 100th anniversary of the massacre, this orphan rug and others like it are serving as a reminder of the US’s first humanitarian relief effort, and allowing Armenians to connect with an important, if bitter part of their heritage. 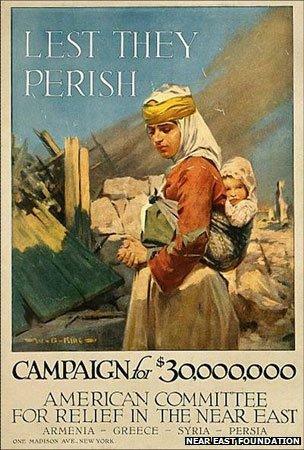 The American Committee for Syrian and Armenian Relief, now known as the Near East Foundation, was the first nonsectarian international relief campaign to exist in the US. It was founded in response to the plight of Armenians, Greeks and Assyrians who were subject to deportation, forced marches, starvation, and execution at the hands of the Ottoman Turks, in the early months of World War One. 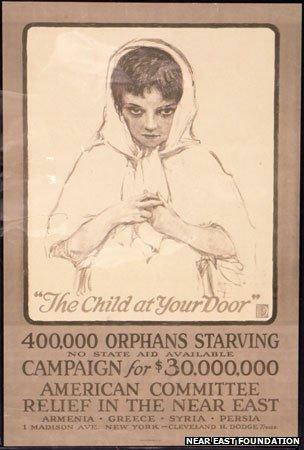 Cans of condensed milk were collected at film screenings across the US, and child actor Jackie Coogan who starred in Charlie Chaplin’s classic, The Kid, passionately campaigned to raise funds. More than $110 million – an incredible sum at the time – was donated to fund schools, orphanages and other facilities. These efforts saved the lives of a million refugees, including more than 100,000 Armenian orphans. Kunzler’s father, Jacob, was a Swiss missionary working for the relief committee as an orphanage director, evacuating Armenian orphans from Urfa, in Turkey, by foot, wagon and donkey to the mountain village of Ghazir in Lebanon. Once they were settled, he created rug-weaving facilities in the orphanage with the help of Armenian master weaver Hovhannes Taschjian, who trained more than 1,400 Armenian girls in the art of weaving, dyeing and patterning. The orphans were being taught a vocational trade to ensure their economic survival, while also creating the rugs to be sold and donated for fundraising. Affectionately called “Papa and Mama Kunzler”, Jacob and his wife Elizabeth were singlehandedly responsible for saving the lives of 8,000 Armenian orphans, and they were so loved that the girls decided to make a rug for their family too. Elibet, the youngest of the four Kunzler girls, born in Urfa, was invited to choose colours, and eventually decided on blue. The orphans worked to create the rug, which Papa Kunzler then gave to Elibet. Eventually, her parents shipped it to her from Lebanon to the US, just after the end of World War Two. Polly Marshall, Elibet’s youngest daughter, who is now set to inherit the rug, remembers playing marbles with her siblings on it as a child. The Kunzler girls would incorporate the plants and animals in the rug’s design – said to depict the Garden of Eden – within their game. What makes the Kunzler rug even more significant is that it is considered to be a sister to the rug given to President Calvin Coolidge in 1925, as a sign of gratitude for the US relief effort, by this time renamed Near East Relief. Though the Kunzler rug is much smaller, both rugs contain the same animals, plants, medallions and Armenian symbolic imagery. 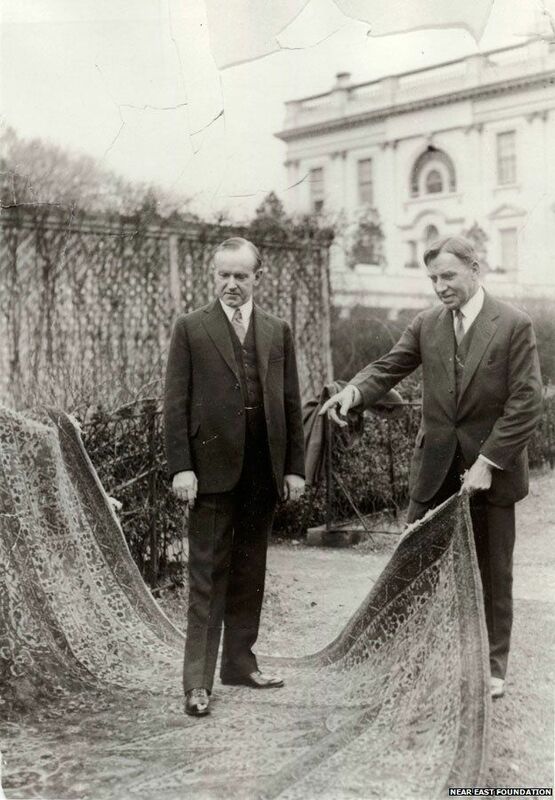 When the Coolidge rug briefly went on display last year at the White House Visitor Center, Polly Marshall was one of those who paid an emotional visit to see it, and even found herself sneaking behind the rope to touch it. When Mangassarian-Goschin approached Marshall to see if she would allow the Kunzler rug to be displayed, she agreed without hesitation. If people couldn’t see the White House rug – which has spent most of its life in storage, and was quickly returned there – they should have the chance to see its sister, she thought. It is now slated to be exhibited temporarily at the Ararat-Eskijian museum in May. “If this rug can help ease people’s pain or help connect people to their ancestry, it’s the least we can do, to make it available,” Marshall says. Hratch Kozibeyokian, a third-generation master weaver and president of the Armenian Rugs Society, says the global Armenian community is slowly realising the power of the story the carpets tell. “There are only a few places our history is recorded – in our folk songs and our carpets,” says Kozibeyokian, who helped decipher the similarities between the Coolidge rug and Kunzler rug. But the rugs are unravelling a little-known part of American history, too. 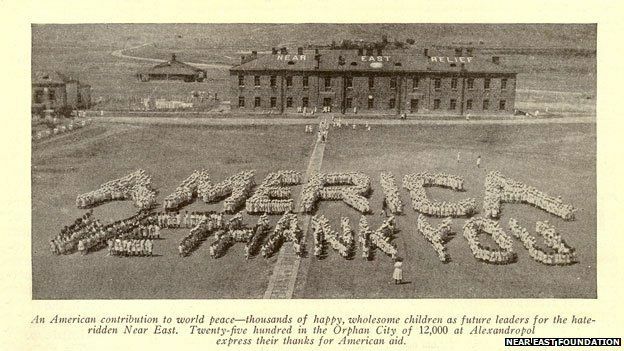 This year, the Western region of the Armenian National Committee of America launched a campaign called America We Thank You: An Armenian Tribute to Near East Relief, to pay tribute to the organisation for rescuing Armenian orphans and other survivors of the massacres. Shant Mardirossian, the grandson of survivors and chair of the Near East Foundation’s board of directors says the story of the American generosity helps bridge the gap in the dual identities of third and fourth-generation Armenian-Americans. The US is now home to the second largest Armenian population outside Armenia.